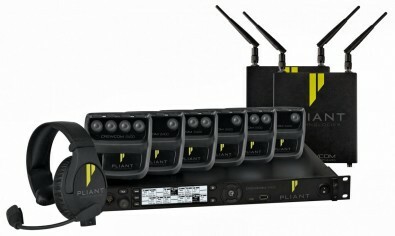 Pliant Technologies will be demonstrating its innovative professional wireless intercom system at this year’s shows. CrewCom can be simultaneously used in both 2.4GHz and 900MHz frequency bands. The CrewCom range of products will be on display at the 2018 IBC Show, along with Pliant's line of SmartBoom PRO professional headsets. CrewCom is based on a new technology platform that offers the industry's highest wireless user counts, unparalleled range, and unprecedented scalability for a range of installation projects for live sound, broadcast, industrial, and more. CrewCom features excellent voice quality, the industry's smallest fully-featured professional full-duplex radio packs, multiple simultaneous frequency bands, as well as a host of truly amazing user features. With CrewCom, production crews of all sizes can easily and quickly deploy communications solutions to connect more people in more places than ever before. For the smaller system and UHF-replacement market, CrewCom offers the easiest system deployment along with the most user-friendly radio pack on the market. Even the most basic CrewCom system offers full features at an exceptional value. Unlike a matrix-based architecture, CrewCom is based on a decentralised network platform that puts system resources where they are needed. This innovative approach to professional wireless intercoms enables CrewCom to handle almost any application—from simple out-of-the-box solutions to large-scale designs for a diverse range of installation projects. Pliant will also display CrewCom’s graphical software, CrewWare. It provides comprehensive offline configuration, online control, and real-time monitoring of all system components. These new software tools augment CrewCom’s ease-of-use and flexible system scalability for productions of any size. While this is a powerful tool available at no additional charge to all users, it is not required to operate the system.